There’s a bit of a mystery brewing in a small central Alberta community that’s been traced to the parking lot of a grocery store and is causing mayhem with key remotes. About three weeks ago, people who parked at the Co-op grocery store in Carstairs found out the hard way that something was awry with their keys when they tried to lock or unlock their vehicles. “We were notified approximately three weeks ago from a number of guests having difficulties with their remotes. It was a mystery at that point,” says Stephen Kennedy, asset protection manager with Co-op. The perplexed drivers, struggling with the malfunctioning remotes, often ended up setting off their own car alarms and were unable to shut them off. Kristina Kapeller, who co-owns an auto repair shop across the street, says drivers often come over for help. Kapeller says that it mainly seems to be Dodge vehicles that are affected, but it does happen in other makes too. Over the past two weeks, she says she’s helped about two dozen people with their stubborn key fobs. Shirley MacRae, driving in from Calgary, says she experienced the strange issue with her brand new Hyundai on Thursday morning. Kennedy says they’ve been in contact with the province, but the issue likely has to do with the radio frequencies the remotes use to communicate with their associated vehicles. However, what’s disrupting that connection remains a mystery. Businesses in the vicinity will be executing another plan to try and track down where the signal is coming from. On Thursday evening, each one will shut off their power one at a time to see if any of them are to blame. Even if they don’t manage to learn anything, Kapeller will continue to help out where she can. 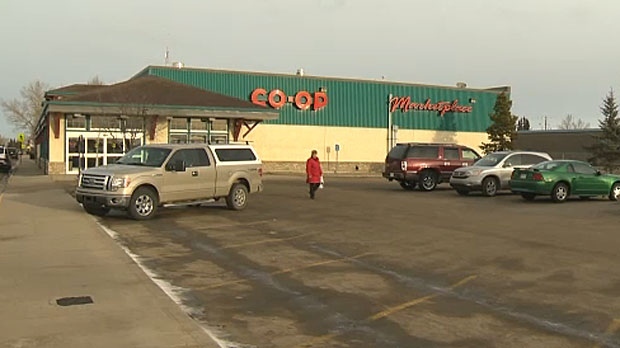 Key fobs of drivers who park at the Co-op grocery store in Carstairs are being affected by a strange phenomenon.